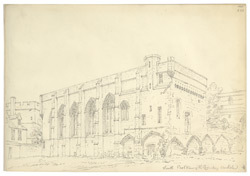 This refectory, also known as the Fratery, is attached to Carlisle Cathedral. The Cathedral , founded in 1122 as a priory church, is the second smallest in the country. Inside the refectory is a small apartment, ascended by three steps and containing a stone seat, supposed to have been a confessional.